To many users, the flow cytometer is a magic box: put in cells, get out data. You click the button to tell it which colors to look at without much thought about how the machine does this. However, not all fluorophores are created equal—some configurations might exclude the spectrum you’re really looking for. 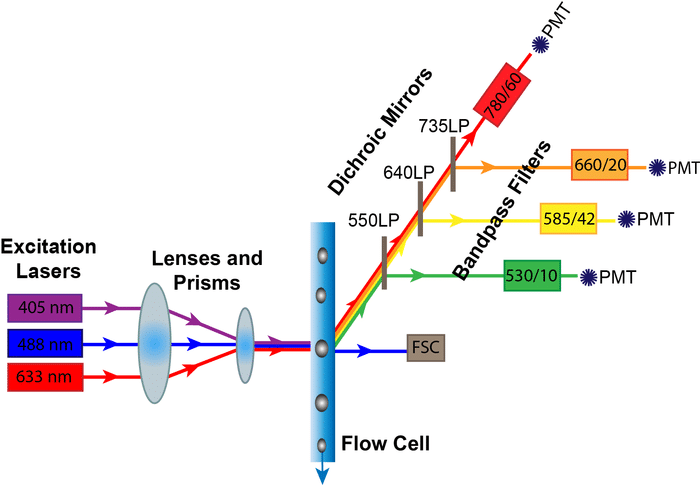 Here’s a brief rundown of the components of the optics system of the flow cytometer and how they help you get your data. The excitation lasers are guided by prisms and lenses into a focused beam into the flow cell where they meet your samples. Part of this signal comes off and is detected by the forward scatter (FSC) diode. The rest of the scattered and fluorescent light is directed at an angle carried through specific filters, and then finally to the detectors. The components of the optics system that determine which colors can be detected are the Lasers, Dichroic Mirrors, and the Bandpass Filters. The Photomultiplier Tubes, on the other hand, are the critical component for data collection. LASER stands for “light amplification by stimulated emission of radiation.” They are used in flow cytometry to generate a focused sample of light at one specific wavelength. In a flow cytometer, lasers provide the energy that excite your fluorophore of interest. When designing flow panels, make sure that your fluorophores are excited by the wavelengths of your specific flow cytometer. The five most common lasers are the Ultraviolet (355 nm), Blue (488 nm), Violet (405 nm), Yellow-Green (561 nm) and Red (633) lasers. After your light passes through your sample, you need to direct certain wavelengths of light to their respective detectors. Dichroic mirrors direct certain wavelengths of light one way, while deflecting other wavelengths. They come in two main types: long pass and short pass. A long pass filter allows light equal to or longer than their indicated wavelength to pass through, while short pass filters allow light equal to or shorter than their indicated wavelength to pass through. So, if your fluorophore is on a 600 LP Dichroic Mirror–that means that only wavelengths longer than 600 nm will be transmitted to the next filter and detector, while shorter wavelengths will be deflected. After being deflected by the dichroic mirror, the lightpath goes through bandpass filters. Bandpass filters only allow a small range of wavelengths to pass through to the final detector. They are often labeled with two numbers (e.g., 450/50). That means that the filter will detect the wavelengths of the first number within 50 nanometers, or in this case, 425 to 475 nanometers. When designing flow panels, check that your emission wavelength falls within these bandpass limits or you won’t be able to detect it! After the signal passes through the bandpass filter, weak fluorescent light needs to be amplified to be measured. A photomultiplier tube (PMT) amplifies the signal by converting the photons of light that make it through the mirrors and filters to electrons that generate a voltage pulse. This voltage pulse is then converted to a digital readout that appears on your computer screen. Users can tweak this signal by applying a voltage to the photomultiplier tubes to amplify the signal even further and bring the specific fluorescence signal into a desirable detector range. So, what does all of this mean for you, the user? When designing a flow cytometry panel, make sure that the configuration of your flow cytometer is compatible with your fluorophores, especially when using uncommon colors. In addition to checking the excitation and emission wavelengths, double check that the emission wavelength isn’t deflected by a long or short pass filter, or that it falls within the range of the bandpass filters you have installed on your machine. For example, if you’re using a MitoTracker Red stain that emits light at 599 nm, and you only have a setup with a 525/50 bandpass filter, you might not get the optimal signal since the bandpass filter only collects light up to 550 nm. Hopefully, the optics system is no longer a mystery to you and is, instead, a valuable tool you can use to add power to your experiments. What other questions do you have about flow cytometry?